This entry was posted in Campus Announcement and tagged Toomer's Corner on March 26, 2014 by Wire Eagle. AUBURN UNIVERSITY – Phase I of the redevelopment and enhancement of Samford Park at Toomer’s Corner is scheduled to begin Wednesday, April 2. In preparation for the work, the iconic eagles perched on top of the 1917 brick gates will be temporarily taken down Thursday morning, March 27, by The Lathan Company Inc., a Mobile-based firm which restored the eagles in April 2012. The eagles will be stored on campus and returned to the corner upon completion of the project. The gates will remain on site during construction. 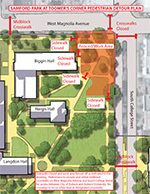 For a pedestrian detour map, go to http://www.auburn.edu/communications_marketing/oaks/detour.pdf. 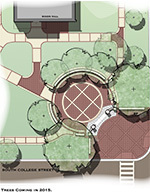 For a site rendering, go to http://www.auburn.edu/communications_marketing/oaks/tree_render.pdf.